1. Wash hands, tear down and prep paper (place in soaking tray if it is sized and needs advanced soaking time). 2. Remove the small stop (brake) from between the press bed and the frame, and pull the bed all the way out one side of the press, check and clean the press bed using simple green. 3. Check the pressure on the press, and adjust if necessary. 4. If using a registration template set this up as well. 8. When removing ink from the can scrape an even layer off the surface with a spatula using a circular motion. Do not jab the spatula into the can. 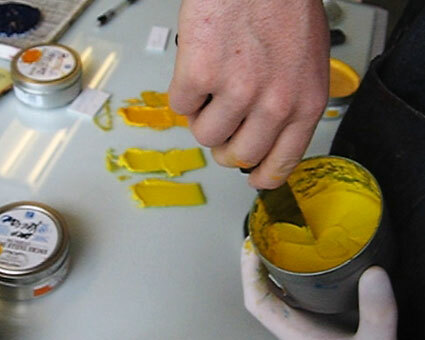 If the ink is stored without use for a period of time it is easy to peel of a dried layer from the top of the can if this surface is preserved as flat and smooth as possible. Mix the oil and pigment in the ink on the stand with the spatula. Add any modifiers at this time if necessary. 9. Set the plate on with the edge just barely overlapping the edge of the ink stand or the edge of an old phone book. This will prevent you from depositing ink all around the plate and expedite both the printing and the clean-up. Scoop up a bead of ink with the card and deposit a well of it along the top edge of the plate. 10. With the card held at a 75 degree angle, draw the ink from this well across the surface of the plate from top to bottom. Keep a bead of ink between the card and the plate to act as a lubricant and prevent the card from scratching the plate. 11. Rotate the plate one turn clockwise and draw the ink across its surface again forcing the ink into the crevices of the plate. 12. If the plate is etched particularly deep, of has drypoint with characteristically tall burrs, you may wish to card the ink across the plate from all for directions. Card the excess ink off the surface in the final pull of the ink prior to wiping with the tarlatan. 13. Wipe any excess ink from the edge of the plate prior to wiping it with the tarlatan to avoid dragging this excess ink across the surface unnecessarily. 14. Begin wiping the plate with a tarlatan Tarlatans should always correspond to the color of ink you are using. Roll the tarlatan around itself until you have a solid feeling ball with a smooth surface to make contact with the plate. 15. The tarlatan touches the surface with relatively light pressure. Remember when printing an intaglio print, the intention is to remove the ink from the top, smooth surfaces of the plate, leaving the ink in the recessed areas. If your pressure is too strong or your tarlatan too loose you will force the material into the plates crevices and over-wipe the plate. The touch of the plates surface occurs with a movement of the arm and a rotation of the wrist. Rotate the tarlatan periodically when the fresh ink trapped in it's fibers deposits ink on the plate instead of removing it. 16. The final film of ink is removed with hand wiping. Hand wiping gives you tremendous control over the plate tone. Stretch the hand pulling the skin taut over the surface of the palm. Use the large flesh pads of the palm immediately below the thumb and below the little finger. The gesture of the palm when wiping is again a light, quick, rolling motion. 17. Hold the plate by vertically standing it on its edge. Check the back of the plate for any excess ink that may have been picked up there. Wipe this ink off. Again a single layer of the tarlatan over the tip of your finger works well for this. 18. Clean the bevel edge of the plate, so any ink potentially remaining there will not detract from the image area of the print. 19. Place plate on the press bed. 20. Wash hands, prior to handling paper(use Go-Jo). Damp paper is very sensitive and will pick up any dirt it comes in contact with. 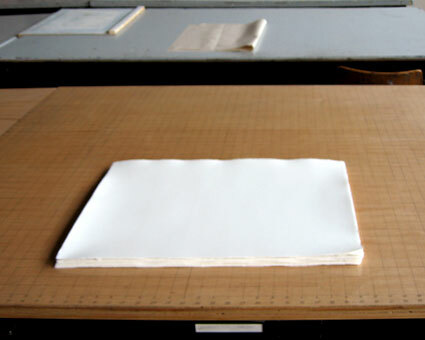 when editioning, you can put a clean pair of gloves on to protect the paper if you are both wiping plates and handling prints. Some printers use folded pieces of paper as tabs for protecting the damp paper from their finger tips. 21. Drain the dampened printing paper. Handling the paper on a diagonal is recommended. Lightly squeegee the water from the papers surface, then blot remaining moisture from the sheet. 22. Brush the papers surface to remove any debris it may have picked up. 23. Center paper over the etching plate on the press. Again handling the paper on diagonal corners makes this step easier. 24. Pull felts taut, then gently place/lower over paper and plate. make certain there are no wrinkles or bumps. An alternative to this (especially when color printing--registering multiple plates) is to support the felts as you crank the press. Be certain to keep felts smooth, preventing any wrinkles when running them through the press. 25. Crank print through press, leaving the edge of the blankets just engaged under the roller at the end of the process. 26. 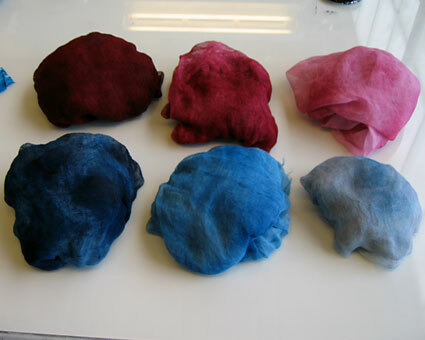 Carefully lift felts from the press bed so as not to disturb paper and curl them back over the top of the press. If you are registering multiple plates for a color print, leave the top edge of the damp paper trapped between the roller and the press bed in a fixed position while swapping the plates. 27. 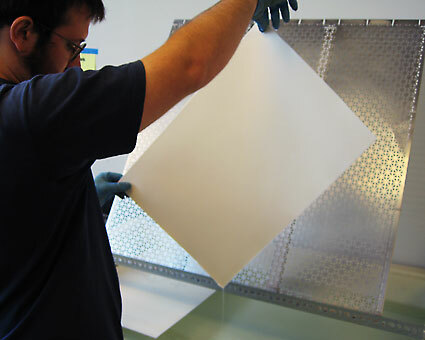 Carefully peel the printed impression from the plate, lifting just one of the corners furthest from the press roller. 29. 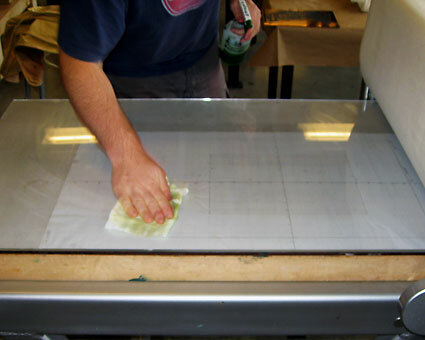 Remove plate from the press, clean plexi bed with simple green, place your plate in the vented room. 30. With clean hands, disengage felts and drape them neatly (no wrinkles) over the top of the press (with the sizing catcher facing out to dry). 31. Return the press bed to the center of the press and replace the metal stop. 32. Pin print to stretch and dry (intermediate & advanced students may use dryer for edition quality prints). There is more detailed information below regarding both these drying methods. 33. Return to the vented room and clean the ink from your plate with varsol. Dispose of any solvent soaked towels in the covered garbage cans. To prevent loss of your plates, please store them in your drawers or lockers. 34. Clean the ink slab by scraping the bulk of remaining ink off glass ink stand with spatula. Remove excess ink film with razor blade, depositing excess ink on a phone page then disposing of it. 35. Clean and degrease ink stand glass with simple green. Clean any ink from the trim on the ink stand. Clean ink from spatulas and return to hanging on the tables edge. 36. Cut a new wax paper cover for the ink in the can. Push the wax paper down against the ink to remove any air bubbles. Replace the lid on the ink can and return it to the proper storage area. 37. Dispose of used ink cards and soiled paper towels, leaving the studio ready for the next student to print. Pin print to stretch and dry (intermediate & advanced students may use dryer for edition quality prints). When pinning your prints to dry, it is advisable to leave no more than 1 inch between the pins. A larger gap between the pins may permit a lightly sized paper to create stretch marks. Use the space in the dryer wisely. This may mean that you can fit 2 medium prints, or 4 small prints per layer prior to adding the next layer. Place a Post-it note in the layer where your print is so that the edge, with your name written on it sticks out. This will help you locate your print readily. BE COURTEOUS OF OTHERS PRINTS IN THE STACK WHEN ADDING OR REMOVING YOUR OWN PRINTS. Once the prints for a session are loaded in the dryer, place the bag around the end between the fan and the stack of prints. Place the sheet of plywood on top of the stack, then tighten the band clamps over the entire dryer. Turn the fan on low and leave your prints for 36-48 hours. NOTE: Please be mindful of the communal nature of the VCU etching studio. Conduct a quick glance through the studio at the end of your work period. Return tools proper storage areas, clean off work tables and ink stands, and dispose of any soiled paper towels and newspaper. 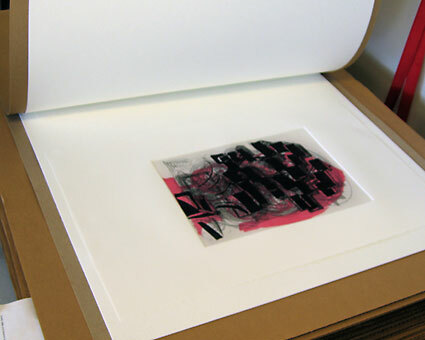 Intaglio - a Studio Manual, was created with support from the VCU Center for Teaching Excellence - Small Grant Program. This electronic intaglio studio manual was authored by Holly Morrison for the students at the VCU School of the Arts.